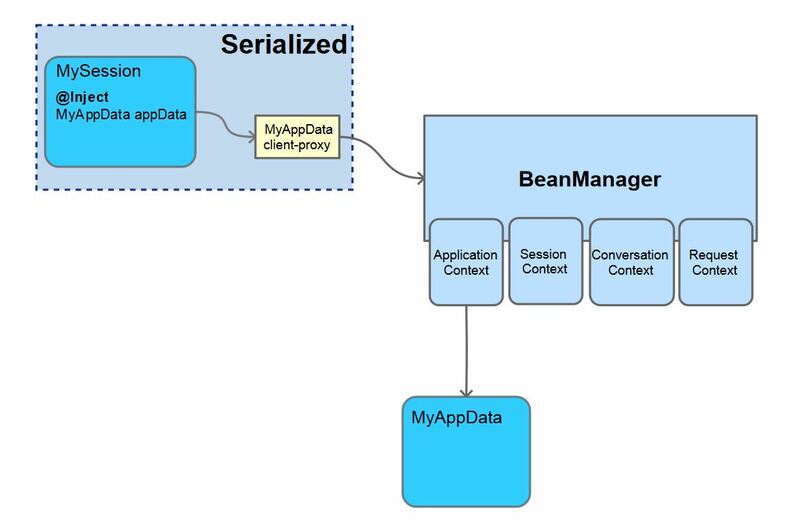 Even so the application scoped bean MyAppData defines a non-passivation capable scope and is not serializable, whereas the client-proxy CDI injects is. When the container passivates the session scoped instance, the injected client-proxies are serialized along with it. When a method is invoked on the client-proxy, a contextual lookup is performed via the BeanManager, which manages creation and access to all contextual beans. …the client proxy will not be serialized nor re-injected during deserialization and remains null. This will cause a NullPointerException on the next invocation. Relaying on the client-proxy works for all normal scopes. Pseudo scopes beans are injected as direct references. So when a pseudo scoped bean such as @Dependent, is injected into a bean with a passivating scope it will need to be serializable or transient. If MyDependent is not Serializable then the myDependent will have to be marked transient. Making the dependent beans inject point transient is not advisable since it will require manual handling during deserialization. CDI performs passivation validations on all beans defining passivating scopes prior to deployment. For every bean which declares a passivating scope, the container must validate that the bean truly is passivation capable and that, in addition, its dependencies are passivation capable. then the container automatically detects the problem and treats it as a deployment problem. …the container detects this at start-up. whilst OpenWebBeans throws a WebBeansConfigurationException. Caused by: org.apache.webbeans.exception.WebBeansConfigurationException: Passivation capable beans must satisfy passivation capable dependencies. Bean : 1113977599,Name:mySession,WebBeans Type:MANAGED,API Types:[java.io.Serializable,java.lang.Object,com.knitelius.MySession],Qualifiers:[javax.enterprise.inject.Any,javax.enterprise.inject.Default,javax.inject.Named] does not satisfy. or its a utility class which should only be used as a method local variable and not as a member. For the other 0.01% of cases it is possible to implement java.io.Serializable readObject to perform custom handling during deseralization . The a new instance of dependent instance of MyUnserializable can be obtained during deseralization from the BeanManager. It is important to note that the CDI container, as per specification, is only required to validate injection points. All other members are ignored by the container. Even though MySession passes the CDI deployment validation, it will fail serialization at runtime due to its non-transient unserializable member causing a java.io.NotSerializableException. All unmanaged members have to be either serializable or transient. Non-serializable beans that are only required for bean initialization can be injected into constructor or intializer methods with the @TransientReference annotation. These @TransientReference dependent scoped beans will be be destroyed at the end of the method invocation. Normal-scoped beans ARE injected as serializable client-proxies, these DO NOT have to be serializable, unless defining a passivating scope themselves, and should NEVER be transient. Pseudo Scoped beans ARE validated by the CDI container at deployment, but HAVE to be serializable or transient if injected into a a bean declaring a passivating scope. Member variables ARE NOT validated by the CDI container, they HAVE to be serializable or transient if they are the member of a bean declaring a passivating scope. Excellent article, thanks for writing it down! When a non serializable field is injected as transient in a passivation capable bean, does or will cdi offer a way to re-inject after activation (such as @PostActivate for ejb stateful beans)? Or is readObject going to be the only way? No – the only way would be to utilize readObject method. What about injecting a resource produced and instantiated by a Producer using the @Produces annotation? This is a common practice to inject instance specific resources like a database connection that is not really persistable, or a HttpServletContext.